All fees included - all inclusive! Indulge in an authentic BBQ lunch - the ultimate Aussie experience! Fraser Adventure 1 Day Guided Tour takes you into the best areas of this environmentally sensitive region to discover its precious ecosystems, abundant wildlife and natural beauty. Throughout the day you will see and do so much and get to appreciate nature's biggest sand island. Seemingly endless golden beaches encompass towering hardwood forests, huge, creeping sand blown deserts, pristine rainforest, crystal clear freshwater lakes, gurgling streams, prehistoric ferns and a mosaic of coloured sands. You will get to see the best parts of Fraser Island on your one day guided tour. With your driver guiding you around the island, you will only have to sit back and enjoy the ride! You will be comfortable in your 4X4 tour bus with coach seating and air-conditioning as you make your way around. There are 16-24 people per bus and no more than 2 busses on each tour, with a max of 40 guests! You will begin your day by leaving Noosa at 6:30am and making your way to the Fraser Island ferry to being your day on the island. Upon arriving, you will get ready to head along the famous 75 Mile Beach via Eurong Resort or Happy Valley, and the inland 4WD Sandy Forest tracks. Stop for lunch and a swim at the freshwater Lake McKenzie, which is known for its clear waters and white beaches, where guests will get to enjoy an Aussie BBQ with a choice of prime sirloin steak, delicate white fillet of fish with lemon, or a vegetarian burger served with a varied assortment of fresh salads, and wash it all down with 'icy cold' complimentary beer, wine or soft drink. Recharged and ready to go your afternoon will see you exploring lush rainforest tracks, where you will get to see the flora and fauna of Fraser Island. Enjoy afternoon tea before heading back to Noosa around 6:00pm and return to your point of pick up. Please note this tour is not suitable if you have neck or back problems or are pregnant. "We went on the all day 4WD tour and had an awesome time. We went to all the important places on Fraser and had ample time to spend at each. Morning tea and buffet lunch included which was scrumptious. Very informative tour guide and drove well on all types of terrain-dirt, beach, etc. 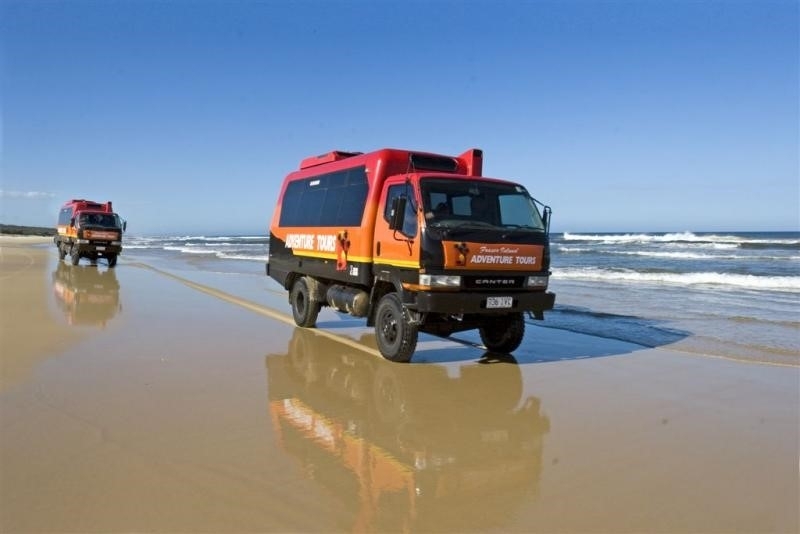 a must do Fraser Island activity!"